The fashion industry has truly embraced digital, from Burberry launching their collection on Twitter to the London Fashion Week Digital Innovation Award examples of innovation can be found from the catwalks to the highstreet. Still waiting on my Catwalk invite, I headed to Victoria Square (my local shopping centre) to see how high street shops are using apps in store. My first point of call was the Swatch Showroom, a pop up shop to coincide with the MTV European Music Awards which are being held in Belfast in a couple of weeks. Swatch are running a daily competition to win a pair of tickets to the event. 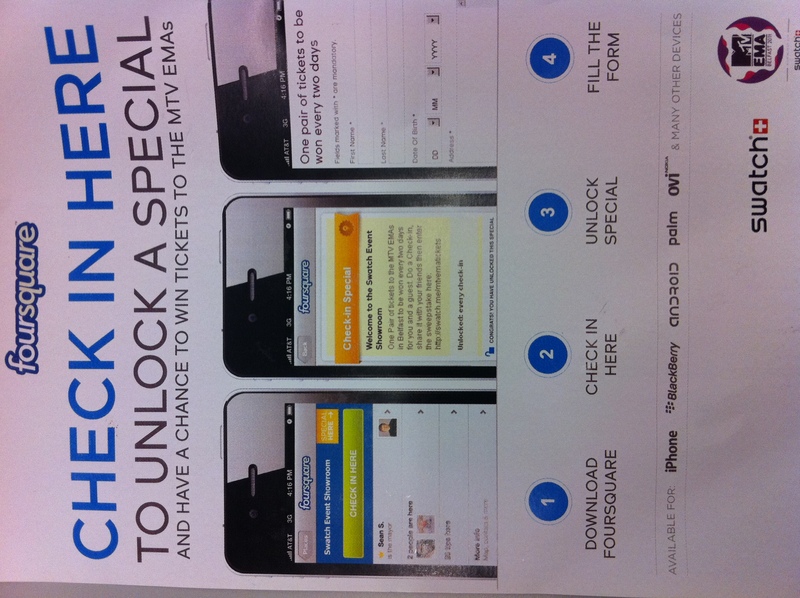 To win shoppers are asked to check in via foursquare. The only problem is very few people in Belfast use, let alone know what foursquare is. (I have a foursquare project I want to develop so I will be watching this one closely.) The girl in the showroom was quite surprised that I new what foursquare was, let alone actually use it. Apparently so few people have it they had to quickly get some flyers printed. Lesson from this example check the relevance of the app, or social media platform before launching a promotion on it! I’m glad Swatch and MTV are trying this out in Belfast, it saves me having to do it myself, instead I shall be watching check-in’s from the comfort of my smart phone. It’s a good idea, but perhaps Facebook Places, or liking their Facebook page would have been more effective. 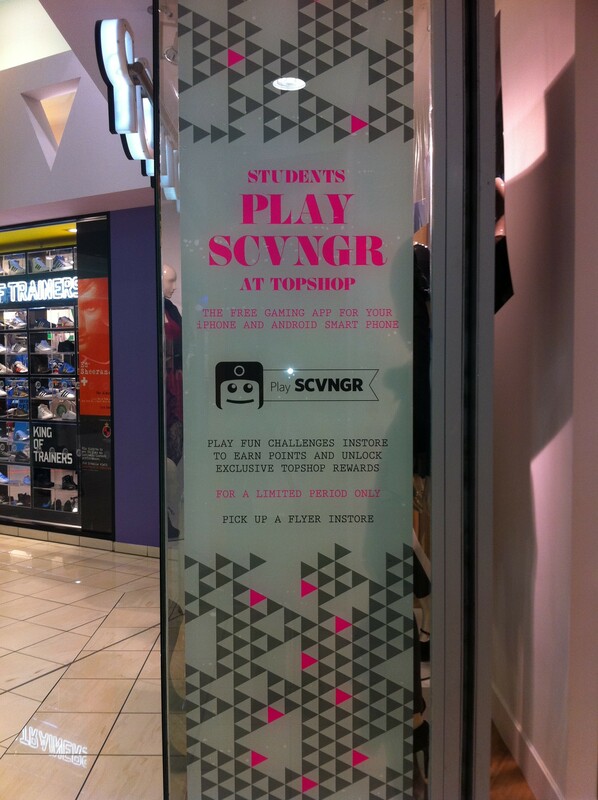 Topshop are using the SCVNGR app to run an instore treasure hunt. Shoppers can complete challenges to gain points, these points can then be traded in for rewards. Rewards range from a 20% of voucher, to entry into a competition to win an ipad and a shopping spree. Tasks include checking in, commenting on Topshop’s SVNGR page, or taking photos of specific items such as shoes, a bag, jeans etc. I really like the idea of this app, but I did find it got in the way of shopping, I was trying on shoes whilst trying to upload photos, writing comments whilst browsing the sale rail. I think the issue was flow, the app required me to engage with it while I was busy shopping. It would have been better suited to use in a queue, or even whilst in the changing room rather than on the actual shop floor. I do think however that SCVNGR could provide an interesting way to engage visitors in museums, or indeed across a number of museums and galleries. Perhaps a multi site SCVNGR hunt that required people to complete tasks inbetween, rather than in venues would perhaps be a good way to develop the use of this app. Who knows…perhaps this research will result in me winning MTV tickets, or even an ipad! How about spending your time online more wisely? Brands having their own apps to connect with their customers and brands using the likes of Foursquare/Scvngr to connect with customers are two very different disciplines. There’s an instant disconnect with the brand and the customer who checks in. A lot of time it’s not a valued, real customer in the real sense, just someone who’s checking in. Plus the onus is on the user to actually check in to get the reward (if there is one). Another issue I have is that the foursquare Mayor of a retailer may have no bearing on the value to the retailer in terms of money in the till. Who’s the most loyal customer? The one who checks in the most or spends the most – two different metrics with two very different answers. That’s why we set out to design Datasentiment that enables retailers big and small to maintain this ongoing relationship between customer and retailer while providing lastminute.com late deals with Tesco Clubcard like customer loyalty. I guess it depends on why brands are using apps, if it’s for a promotional purpose, to generate hype or social buzz then social platforms such as Foursquare and Facebook can work well. A Foursquare ‘Mayor’ may not be the most loyal customer, but they are likely to have a greater social media presence/ following and therefore provide a link between a brand and the ‘Mayors’ social network. I agree however that there is a need to explore how brands respond to real loyalty, and perhaps Datasentiment is one way that they can do this. I guess its about planning, do you want to run a promotion? or, do you want to reward brand loyalty? The difference between the two is often overlooked.